This is a Gestetnet 360 duplicator. 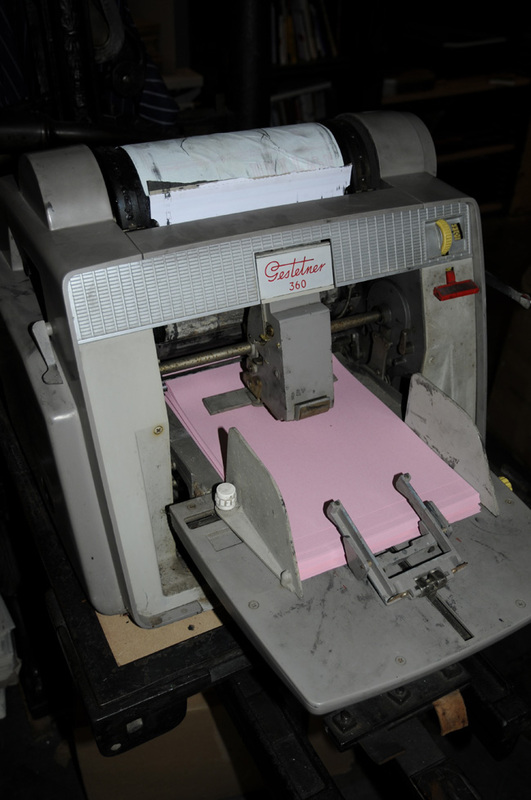 The church purchased one in 1972 and it was used for producing newsletters and other materials through until the eighties and the advent of modern computers and photocopiers. This picture is from some time in the seventies. This plastic notice was placed for many years over the entrance to the hall next to the church. it was placed there becasueat the end of the seventies the chapel hadbecome derelict and meetings took place in the hall adjacent. It actually remained there throught the eighties, nineties and beyond and was only taken down in 2015 when a new notice board was installed. From The Middlesex Courier, October 17, 1890. To the Reverend William Rickard, on the completion of 25 years ministry at Child's Hill Baptist Chapel. As we review your quarter of a century of loving service in this part of the Master's Vineyard our hearts are full of gratitude to our heavenly father for inspiring you with such untiring devotion. You have preached the Word with great clearness, faithfulness and force, and your ministry has been constantly marked with the fervent aim of rousing conscience and driving the sinner from all false hiding places to Christ, and of leading the Saints to a livelier walk with God. And whilst this part of pastoral work has been nobly done you have never neglected to visit us in our homes, being to us at all times of need, Counsellor, Comforter and Friend. We are not forgetful also that this service has been rendered oft-times by you in the midst of great weakness and suffering, and as we think of this our hearts are touched with the deepest sympathy towards you in your present weakness and our prayer is that God may grant you renewed strength for future work. We recognise gratefully the blessing you have proved to Child's Hill for you have not only been the principal instrument in founding the Baptist Church here 25 years ago but you have undertaken the burden of establishing and finding the funds to carry on the day school where many hundreds of children have been educated. You have started and carried on very successfully for over 20 years, Provident Clubs for men and women which have encouraged thrift and afforded help to hundreds of families in times of sorrow and need. As a token of respect for you and of appreciation of your work, we desire, on behalf of the Subscribers, to present you with this address and a cheque for £210. We are, dear Sir, Yours faithfully. Deacons of Childs Hill Baptist Church, Richard Keevil, James T. Cox, E. L. K. Muir, John Gillard, George W. Clark, Thos. Roberts, (Secretary), Benj. A. Lyon, (Treasurer of the Fund). 13th Oct. 1890. — Mr. Rickard in reply said he could hardly thank them sufficiently for the beautiful present, and in a few brief remarks said that he hoped his strength would be spared for many years of work amongst them in the future. Addresses were also delivered by the Revs. W. Brock, G. D. Hooper, and F. B. Monk, Messrs. W. R, Ricketts, C. Richards, and W. T. Roberts. The Vicar of Childs Hill also sent his best wishes, accompanied by a book entitled "The Life of a Soul in the World." The collections which were taken at each of the services were in aid of the Church Funds. BAPTIST CHAPEL.— The temperance meetings for the forthcoming season were began on Wednesday evening last in the British Schoolroom, when an entertainment was given by the Chapel choir and friends, and consisted of solos and duets, quartets and choruses, recitations and were well rendered. Amongst others, a recitation by Miss F. Watts, a solo by Miss Russell, and a comic song; by Mr. Barratt were well done. Altogether a very attractive programme has been got together, and the meetings will be held each alternate Wednesday, in the British Schoolroom. Baptist Chapel.—The anniversary of this church was held on Sunday last, when appropriate sermons were preached by the pastor, the Rev. J. Sylvester Poulton, to good congregations both morning and evening. On Tuesday a public tea was held in the British School, when the prettily-arranged tables were well filled with provisions and guests. The evening public meeting was held in the chapel, which had been tastefully decorated for the occasion. Mr. Herbert Marnham (of Hampstead) took the chair and was supported by the Rev. W. Brock (of Heath Street, Hampstead), Rev. H. B. Murray (of Canterbury Road, Kilburn), and the pastor. A letter was read from the Rev. W. Whittley. (of the Lown Memorial Church, Cricklewood*) expressive of his regret at being absent, which had been occasioned by the sudden and serious illness of a relative. The meeting was a very hearty one throughout, suitable and stirring addresses being given by all the speakers. 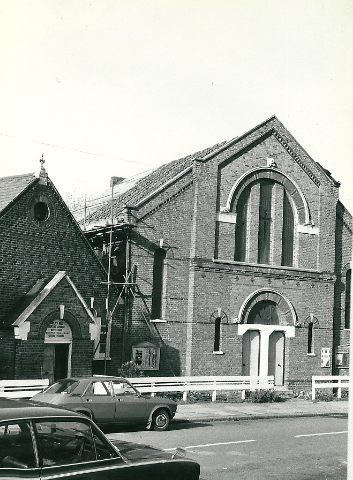 The report, which was read by the secretary (Mr. J. Moore), showed that a quiet, steady work was being done by the church, and that a decided progress had been made in all the organisations. The pastor expressed the thanks of the church and congregation to the speakers, and to all those friends who by their offerings of money and service had contributed to the success of the anniversary. 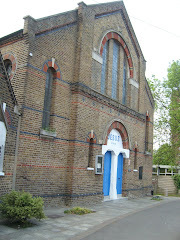 *This is the church that began in 1885 as an iron mission chapel in Cricklewood Lane, an outreach of Lyndhurst Rd, Hampstead church 1885. The congregation moved the other side of Cricklewood Broadway to ao brick building, Lown memorial hall in Howard Rd, in 1893. A new chapel in the Gothic style with a tower was opened 1902 in Chichele Rd. In 1903 the attendance was 187 am and 402 pm. By 1978 it had only 21 members and closed. It reopened as a mosque in 1980. The following notice appeared in The Middlesex Courier for February 1, 1896 on Page 4. CHILD'S HILL. Funeral of the Rev. W. Rickard—On Saturday last the funeral of the Rev. W. Rickard took place. The reverend gentleman had for the' past thirty years laboured for the - Nonconformist cause in Child's Hill, and just over twelve months ago was compelled, through ill health, to give up his work. It was felt by those who knew him that the end was gradually approaching, and on Tuesday, the 22nd inst., notwithstanding a painful operation, he breathed his last. If 'anything were needed to show the universal respect and love to which Child's Hill residents regarded Mr. Rickard, it was in the vast crowd of all denominations which assembled on Saturday in the Baptist Chapel to pay their last adieus to their departed minister and friend. The service was conducted by the Rev. W. Brock, of Hampstead, and after a very impressive ceremony the funeral cortege moved in the direction of Marylebone Cemetery, at Finchley, where the remains of the loved pastor were laid to rest. The coffin was surrounded with wreaths, and many were the expressions of sympathy. On Sunday a memorial service was held in the chapel at Child's Hill, when the Rev. J. S. Poulton was present (but unable to preach through a bad cold), but the Rev. W. Brock preached an eloquent sermon to the crowded congregation. He dwelt on the virtues of Mr. Rickard, and urged upon all the necessity of perfection in this worldly state, to fit ourselves for the glorious hereafter. An interesting note occurs in the minute book for church meeting September 26, 1878. Considerable conversation took place relative to the best means under God of promoting a revival of religion in the church and neighbourhood. Please don't leave no abuse. The late Leslie Wright, the fourth pastor. Minister 1954-1961. The Snippets were originally prepared for our newsletter in the 1980s. Difficult to believe it was so long ago; he felt young still! ... those Sunday afternoons on Hampstead Heath, when young Jolyon and he went for a stretch along the Spaniard's Road to Highgate, to Child's Hill, and back over the Heath again to dine at Jack Straw's Castle - how delicious his cigars were then! And such weather! There was no weather now.